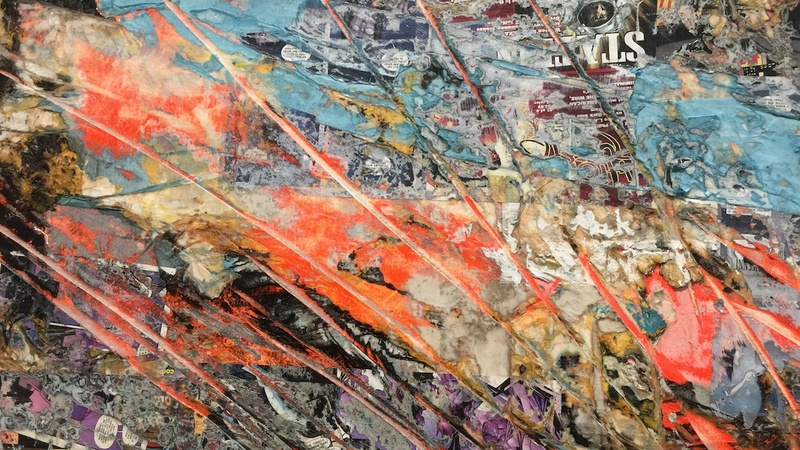 The press release for the solo exhibition by Mark Bradford at Hauser & Wirth Los Angeles says that it is proud to present “the artist’s first gallery exhibition in his hometown…in over 15 years.” And proud, it should be. Mark Bradford in front of Bird of Paradise, talking about his exhibition at Hauser & Wirth Los Angeles, New Works. Photo by Edward Goldman. In 2009, Mark Bradford was awarded the so-called “Genius Award” by the prestigious MacArthur Foundation. In the following years, an in-depth retrospective of his work traveled across the country, starting in Columbus, Ohio, then to Boston, Chicago, Dallas, and San Francisco. To the dismay of Los Angeles art aficionados, this exhibition never came here, to his hometown. (T) Mark Bradford. Finding Barry. 2015. (B) Detail image. Photos by Edward Goldman. 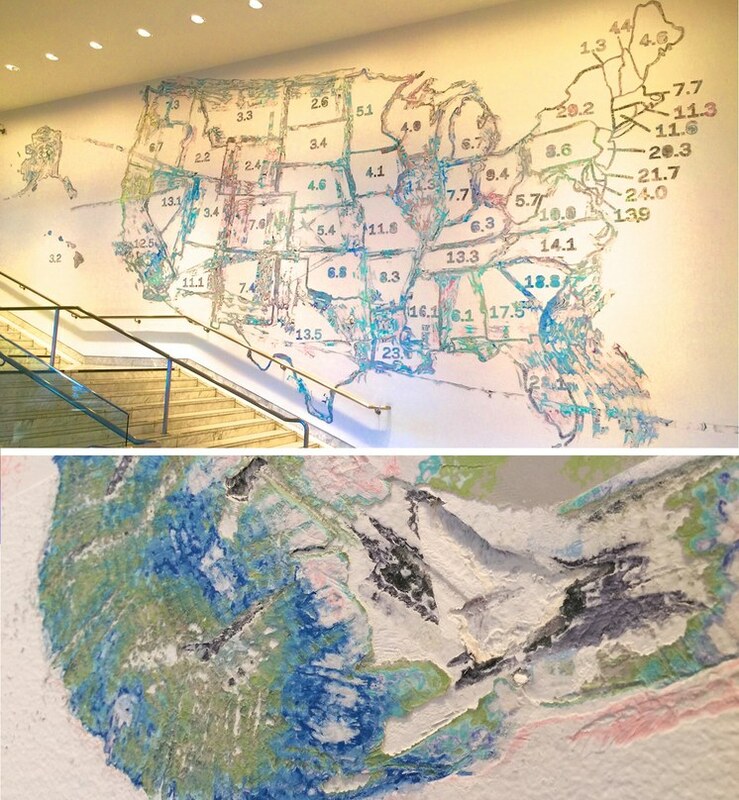 We should be grateful to the Hammer Museum, which in 2015 organized Scorched Earth, an exhibition by Mark Bradford consisting of 12 new large mixed-media paintings, and a mural in the museum lobby, where the artist literally dug into the wall – similar to the way an archeologist digs into the earth to uncover an ancient settlement. 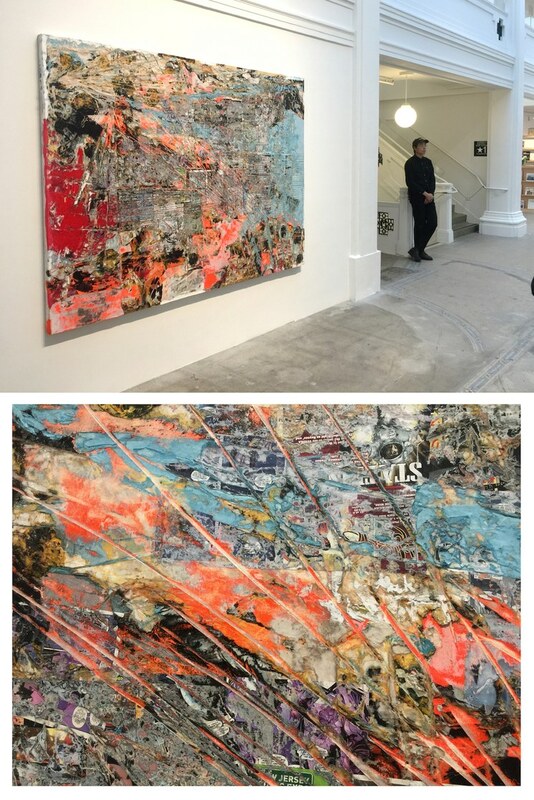 Top: Mark Bradford, Looking at me funny. 2018. Installed at Hauser & Wirth Los Angeles. B: Detail of Looking at me funny. 2018. Photos by Edward Goldman. 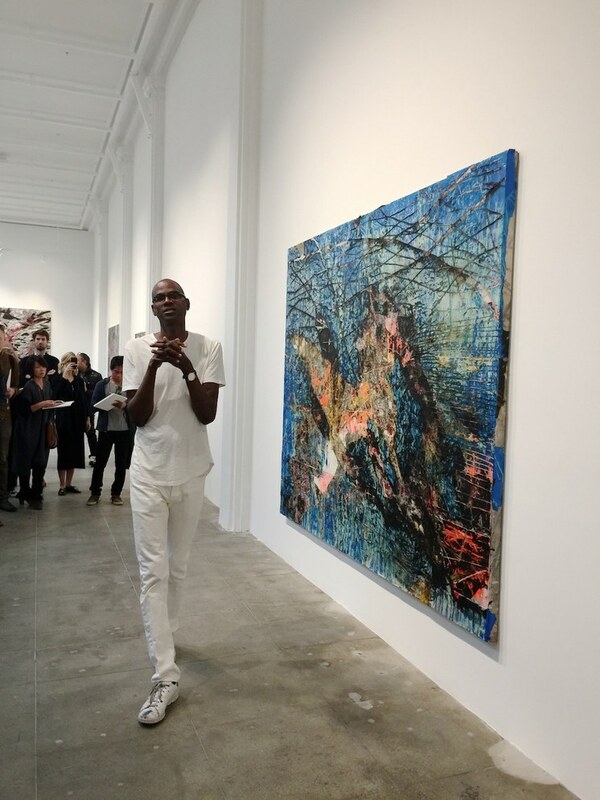 At the opening of his exhibition at Hauser & Wirth last week, Mark Bradford, with his trademark eloquence and charm, spoke about his new body of works – 10 monumental mixed-media paintings with layers of billboards, posters, newsprints, comics, magazines, and endpapers, used in hair salons. If you see these new paintings from a slight distance, it’s difficult not to be seduced by their dramatic, theatrical manifestation of gesture and color. But, only when you come close, with your nose almost touching the surface, will you discover that, once again, the artist, like an archeologist, has dug through layers of visual social commentary to create a uniquely rich texture for this new body of works. 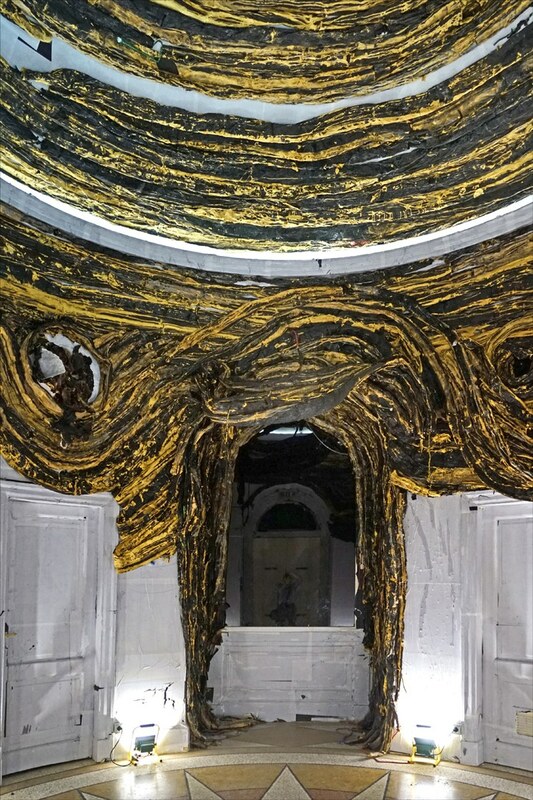 It’s not a surprise that Mark Bradford was chosen to represent the United States at the 2017 Venice Biennale, where his exhibition at the US pavilion, Tomorrow is Another Day, was one of the most talked-about projects at the Biennale. 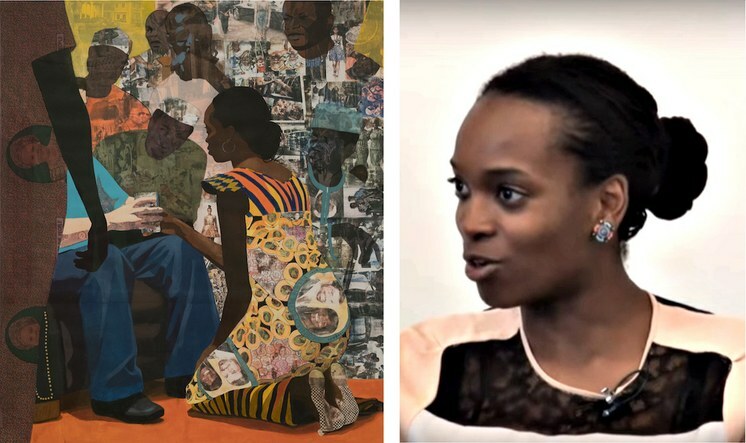 L: Portals, Njideka Akunyili Crosby. 2016. Image by Sharon Mollerus, Flickr. R: Michelle LaVaughn Robinson Obama by Amy Sherald, oil on linen. 2018. Photo courtesy of National Portrait Gallery, Smithsonian Institution. 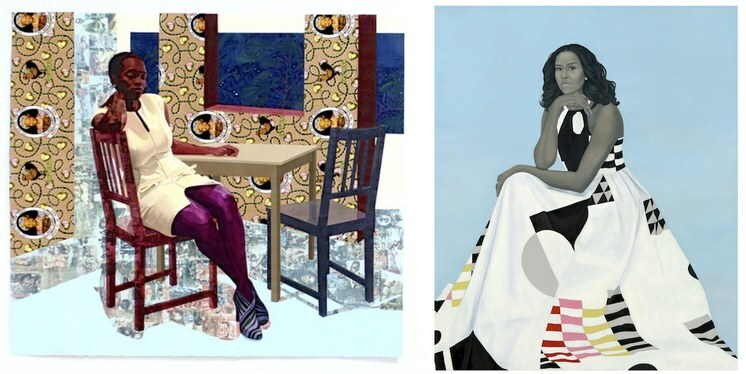 Last week, I spoke about the Obama portraits unveiled at the National Portrait Gallery. The portrait of Barack by Kehinde Wiley is, in my opinion, top-notch. But, the portrait of Michelle by Amy Sherald is a strangely detached painting, capturing her likeness, but none of her unique spirit and character. Definitely, I didn’t mean any disrespect to the artist Amy Sherald, whose skill and technique are impressive. But, somehow, this portrait makes me think of an artist who is driving a Porsche on the freeway at a mere 25 miles an hour. And, that’s why I keep coming back to Njideka Akunyili Crosby, a MacArthur Genius Award recipient for 2017, who drives her artistic Porsche at hundreds of miles an hour.